Have you every tried to diet or limit a certain food? What about your children – have you ever tried to impose food rules on them? It’s probably pretty safe to say that most of us can answer yes to at least one of these two questions, if not both. Let me first say there should be no shame or judgement on yourself if you did answer yes to either of these questions. You are living in this culture along with all of us. It is a highly problematic diet culture. Even as a dietitian that does this work – I’ve had my own journey around healing my relationship with food. This means that I’m not immune to food rules either. However, the real fact of the matter is – a diet is any attempt to restrict any food. 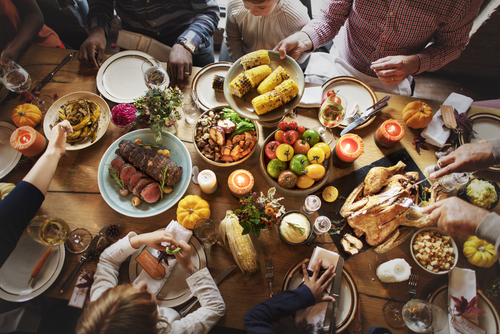 In all of these examples – a single food group or groups are being limited and can make anyone feel guilty about what and/or how much they have eaten. 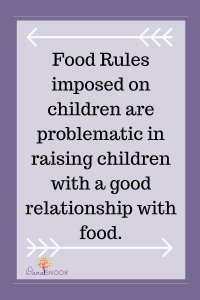 However, this becomes even more problematic when we try to impose these food rules on our children who are growing and can not cognitively understand these food rules. Let me show you my diagram of what happens when we impose food rules on our children. So let’s say for the sake of an example you are restricting your children from eating sweets. Your child will know they are restricted; this will lead to them feeling deprived of this food, the biological hunger for these foods will still happen, they will give into eating these foods (if you aren’t allowing them they will sneak them when you aren’t looking), and they may even eat them in large quantities. They will then fall victim to often feeling guilt and shame for wanting/eating those foods. As you can see, this cycle will then restart. It leaves your children (or you) with a constant struggle with food. It never allows them to learn to manage their appetite and/or all foods. I hear from my clients all the time, BUT if I let them eat (X food) they will never stop. They will always obsess or want that food. I know it’s hard to wrap your brain around, but actually quite the opposite happens – when they are free of restrictions it allows your children to relax around those foods and actually learn to eat them more intuitively. Let me start with a personal example. I live next door to our bank; when my daughter was very young she would walk over with myself or my partner. Every time we went to the bank the teller gave my daughter a lollipop. Truth be told it drove me nuts! Why? Because of my own bias around lollipops. I noticed at a very young age she started to become more and more focused on lollipops asking for them A LOT and getting really upset when I said no. One day I had to sit with my thoughts – she doesn’t care about any other food except lollipops…what am I doing wrong? I can laugh out loud about it now because it’s so obvious – I was a restricting them! This is a very small example of restriction, but none the less shows what can happen when restrictions are in place. However, what if you have been restricting way more than that? What if you have been limiting lots of different foods? I can’t tell you how important teaching your children to have autonomy around their eating is. Contrary to popular belief your children are intuitive eaters when we step back and allow them to be. When you as the parent are in charge of what to serve on the table and include a good variety of food, they in turn can learn to listen to their bodies to eat exactly what and how much they need. This takes trust…not control. Take a step back and reflect on meal time. Are you allowing them to serve themselves (or decide what and how much goes on their plate for the little ones)? If not, start here. Serve all the food on the table. Let your child(ren) decide what and how much to eat from what is served on the table. 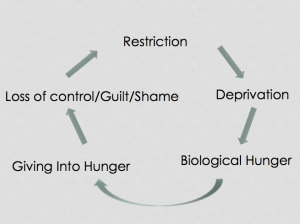 Remember go back to that diagram that I created above – if they feel restricted they will be less likely to eat intuitively and more likely to feel the need to feel guilty and shame around their eating. Now this is a hard one. When I realized my bias around lollipops was getting in the way of my daughter learning how to manage lollipops, I started with serving them… a lot. I got a whole bunch of lollipops and starting making it my idea that she could have them. I served them with different meals or snacks, and this gave her unconditional permission to eat lollipops. And you know what happened? Yes, at first she couldn’t get enough of them, however, eventually she stopped asking for lollipops (well all the time anyway)! Side Note: Her being less focused on them allowed me to relax and trust her too. What is the food(s) that your children are preoccupied with? Can you start by serving them and letting them know they can have them regularly? The very frame work of the model I work with – trust! This can so easily be translated into how you approach trusting your children around food too! 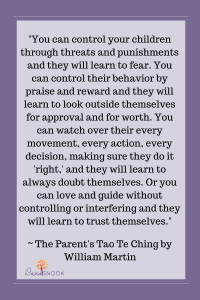 When you lead with trust rather than control your children will benefit. If you instill fear around food or their body size, they will learn to fear foods or their bodies changing. If you try to reward or coerce them to eat certain foods, they won’t learn to do it themselves. 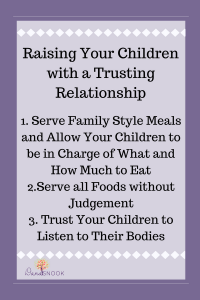 If you are micromanaging their food choices or appetites, they will not learn to trust themselves around food, eat intuitively and connect with their bodies. However, if you can provide a loving, nurturing trusting relationship around food they will learn to eat intuitively and have a healthy relationship with food. While all of this might feel overwhelming, keep in mind, the long term advantage is that your children can learn to have a good relationship with all foods!